just bought a 7210 off Ebay for 99 pence (ex £14 delivery) within the description was "Carriage Jam" message so I knew it was faulty. 20 mins of Googling and a 5 minute clean has it up and running. It did not involve loosening a single screw. - Switch on the printer. - Open the print cartridge lid. - Pull the plug from the back of the machine to avoid risk of electric shock. - Using a light cleaning solution on a lint-free cloth, carefully VERY CAREFULLY, wipe the position strip (on both sides, front and back), then dry it with a dry lint-free cloth. Now move the cartridge carriage to the left and clean and dry the remaining half of the position strip. If you bend this position strip, your printer is knackered. - Gently move the carriage back to the right. 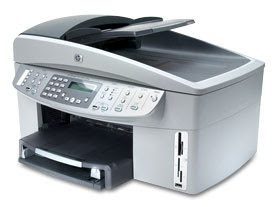 - Holding down the OK and CANCEL buttons, plug in the power lead to the back of the printer and press the POWER button. - Wait until the message DERIV CLEAR ('Deriv' is right - I'm not sure about 'clear' now) appears then release the OK and CANCEL buttons. - The printer should thrash about a little, the carriage will move back and forth and then it should tell you the cartridges need changing and you follow the instructions, pressing OK or selecting the language options. - It will print an alignment page and then you should be good to go. I am a comms technician, I poke, I tweak. I don't give up.